Use the form below to inquire about Village Resort At Kanadukathan . Use the form below to reserve for Village Resort At Kanadukathan . Relive the authentic Chettinad experience at this serene, comfortable, quaint, and homely Village Resort at Kanadukathan. Situated just off an arterial highway connecting major cities in the state of Tamil Nadu, this Village Resort at Kanadukathan is close to many interesting historical attractions. Surrounded by manicured lawns and abundant greenery, this property, only 9 km from NH210, is the perfect place to enjoy some Chettinad hospitality firsthand. Well-lit walkways on the property beckon you for an after dinner stroll while a small seating area outdoors is perfect for enjoying a hot cuppa in the shade after a day of sightseeing. The region is also known for its renowned culinary contribution to the world – Chicken 65! This Village Resort at Kanadukathan has been built to resemble an ordinary Chettinad cottage residence with a brick facade, thatched roof, and pillars embellished with colorful patterns. The furniture all through is vintage with woven and painted patterns that are reminiscent of a bygone era. The restaurant here serves a wide range of mouth-watering Chettinad delicacies as well as a variety of other cuisines. The property also has an outdoor swimming pool for your use and offers Ayurveda treatments if you desire some holistic pampering. Enjoy a bullock cart ride around the village to get a feel of how life was before the advent of machines and technology. 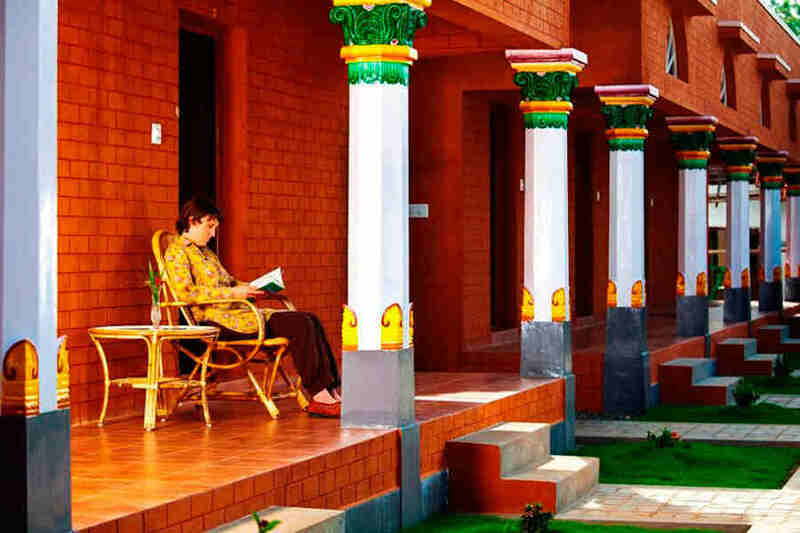 There are eight air conditioned rooms at this Village Resort at Kanadukathan. Colorful floor tiles are found in each of the spacious rooms which though simply furnished with wood and cane furniture, are comfortably so. A seating area and work desk are provided in each room. A long portico runs the length of the resort building with comfortable seating available for you to relax or read a book. The rustic ambiance at this getaway, with its focus on heritage and cuisine, is sure to leave you rejuvenated! Children between 6 to 12 years will be charged. We advise you to guarantee your reservation against Credit card, Cash deposit, Service Voucher or demand draft at the time of booking. Companies enjoying credit facility can guarantee reservations by sending a billing letter duly signed by the authorized person. In the case of a no show or cancellation of a guaranteed reservation the hotel reserves the right to levy retention charges for the entire stay. In the unlikely event of our inability to accommodate a guaranteed reservation, we will arrange an alternative accommodation with transportation. In the case of a no show or cancellation of a guaranteed reservation the hotel reserves the right to levy retention charges for the entire stay. Taxes are subject to change. 100% refund if the booking gets canceled before 20 days. 100% retention charges applicable for No Shows and for the confirmed booking being canceled before 24 hours. The outdoor swimming pool at the resort is good for some lazy laps or for chilling off after a fun-filled day. You could also enjoy an Ayurveda treatment on the premises by scheduling it beforehand. Cookery demonstrations are also conducted regularly at the resort. A leisurely stroll through Kaanadukathan village is a must while at this resort. Enjoy a glimpse into typical village life in Chettinad as you walk by old mansions, a temple, and a tank all the while seeing cheerful and welcoming faces of the locals. You can also choose to do the exploring on a bullock cart which rumbles right up to a saree weaving centre with manually-operated looms, an ancestral mansion, and a Chettinadu museum. Basket-weaving, pottery, and tile-making are some other local industries that you can get a glimpse of. The famous Athangudi Tile Factory, Rajah’s Palace, Thirumayam Fort, and Pillayarpatti Temple, a rock cut shrine with Lord Ganesha and Lord Shiva, are all within easy reach of this property. A trip to the nearby antique market is sure to yield some interesting souvenirs to take back home. Trichy is the closest airport at 73 km while Madurai airport is around 100 km away. Kempegowda International Airport, Bangalore, is around 452 km away. Chettinad railway station is the closest at 1.5 km while Karaikudi Junction is 15 km away and Pudukkottai railway station is 33 km away. Bangalore railway station is at a distance of 425 km. Karaikudi is 15 km away with two routes to get there. Trichy is around 78 km away along NH336 while Rameshwaram is at a distance of 156 km. Bangalore city is around 420 km away via NH44.